Attending the seminar, the guests included Assoc. PhD. Nguyen Thi Huong - Former Deputy Director of Institute of Culture, Assoc. PhD. Dang Huu Toan - former deputy editor in chief of Journal of Philosophy, Assoc. PhD. Nguyen Thi Mai Hoa - Head of Communist Party History, Faculty of History, University of Social Sciences and Humanities (Vietnam National University), Mr. Phan Thanh Nam - Deputy Editor-in-Chief of Culture Newspaper - Ministry of Culture, Sports and Tourism. 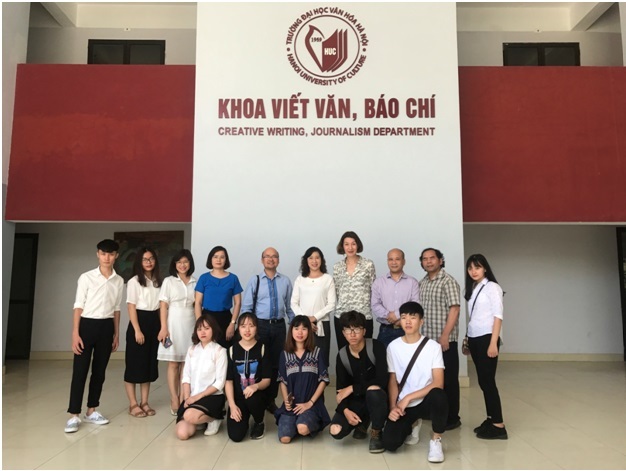 Hanoi University of Culture had the presence of Assoc. PhD. Pham Thi Thu Huong - Vice Rector in charge of Hanoi University of Culture (HUC); Assoc. PhD. Nguyen Thi Viet Huong - Vice Rector; PhD. Dinh Cong Tuan - Vice Rector; MSc. Ha Thi Thu Ha - Deputy Secretary in charge of HUC Party Committee, Head of Personnel Department and heads of all departments, faculty, many officers, lecturers and researchers presented. Speaking at the seminar, Assoc. PhD. 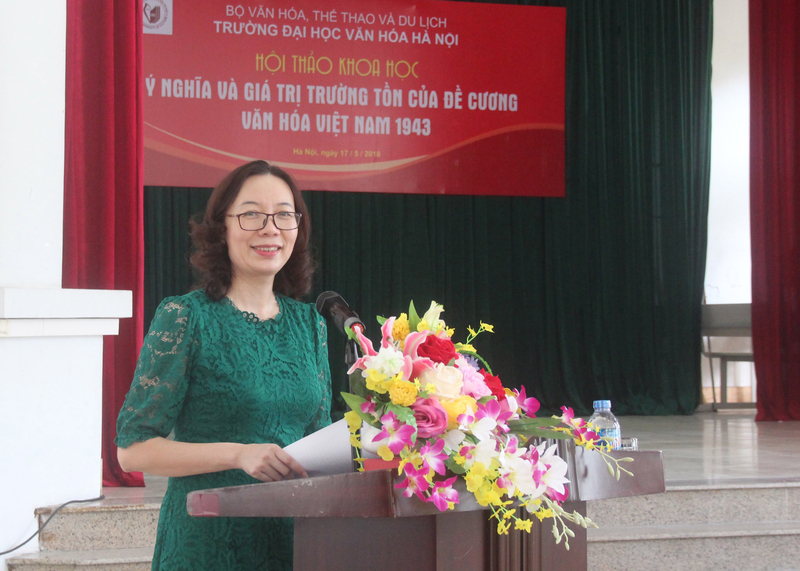 Pham Thi Thu Huong - Vice Rector in charge of the university, Chairman of the Conference confirmed: " Vietnam culture Outline was promulgated in 1943, was written by Mr. Truong Chinh 75 years ago. This is considered as the manifesto and the first program of the Party in culture, which plays the role of orientation for awareness and motto of cultural and artistic activities of the whole Party and people. At the beginning, the Outline made a great inspiration for the Vietnamese people in general, intellectuals and culture activists in particular to take part in the struggle for independence, the eradication of culture subjugation, the political oppression and the economic exploitation of colonialism and fascism”. "This is the foundation for the development and refinement in the culture field of the Party over the past 75 years, reflected in the 5th Central Committee resolution, 8th term (1998) and the 9th Central Committee resolution, 11th term (2014)." Assoc. PhD. Pham Thi Thu Huong emphasized. The Seminar also received enthusiastic exchanges of ideas from experts and researchers, suggesting new approaches in studying the Vietnam Culture Outline 1943, in which emphasized the direction of thinking in accordance with historical materialism to exactly evaluate the value of the Outline. The exchange of ideas also focuses on asserting historical, scientific values and oriented, underpinned role for the development of theories of Vietnam culture over the past 75 years and the application of ideas from Vietnam Culture Outline into the process of shaping the national culture. This seminar brought out a problem that is not new but meaningful in the context in which Vietnam is aiming to shape an advanced, imbued with national identity culture. The contents of the Vietnam Culture Outline 1943, with its basic notions of scientific, ethnical, and popular characters, is still a flowing stream, the basic foundation for the theorizing of culture development of the Party. It can be affirmed that the Vietnam Culture Outline 1943, in spite of its general, showed the great stature and vision of the Party in outlining the basics of the revolutionary culture, played the role of the first manifesto of the Party in culture, was a breakthrough in theoretical thinking about culture, created the foundation, base sustainable values for developing and improving theoretical thinking on culture of the party later.